Lately, the gondola of Timang Beach has become a popular activity for any tourist who visits Yogyakarta. Located in Gunung Kidul Region, the beach offers something appealing especially for an adrenaline seeker. Now, before you decide to book a Jogja sharing tour for visiting the beach yourself, don’t miss this following guide first. It was just an isolated spot before, but it receives so much attention after tourists start to visit the beach and snap the beauty and uniqueness of this beach. In general, it is actually a great choice for you who want to visit a hidden beach in Yogyakarta that offers such uniqueness. There are a few highlights that you can anticipate from this beach. While the whole things may look crazy at first, Timang Beach actually offers a brand new thing that is so much fun. When it comes to Timang Beach, we shouldn’t forget about the gondola since it is basically the main highlight of this beach. But, what can we expect for a gondola in the beach? Here, you can ride the gondola to reach the rocky outcrop on the other side of the mainland. The rocky outcrop here is located about 20 meters from the off shore. The gondola here is made of wood, metal pulleys and blue ropes that entirely seem like a crazy invention. However, it’s luckily safe to ride the gondola. Not to mention that Timang Beach also has that amazing view that is worth a peek. While challenging yourself by riding the “crazy” gondola, you can see such amazing ocean view that you will never forget. You will have a lot of time to enjoy all the beauty. You can also take some memorable photos while on the gondola or in another spot around the beach. It takes you around 3 hours drive from downtown Yogyakarta to reach Timang Beach. If you plan to visit other places during your day trip, there are some possible places that you can add to your itinerary. For instance, you can first go for cave tubing at Kalisuci in the morning since the location is also in Gunung Kidul. After that, you can continue your trip to Timang Beach in the afternoon. With this itinerary, you will be able to visit more than one great place in Yogyakarta in the same day. Moreover, since both of the attractions are close to each other, you won’t spend so much time in the car. The overall tour usually takes 10 hours only. It means that you will still have time to take other interesting Jogja sharing tour. 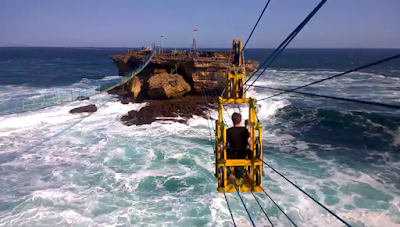 So, are you ready to challenge yourself on riding the “crazy” gondola of Timang Beach? If you are ready and the recommended itinerary above sounds convincing for you, www.jogjabromotour.com can be your very best partner. It offers the best private tour package for exploring Kalisuci Cave and Timang Beach.